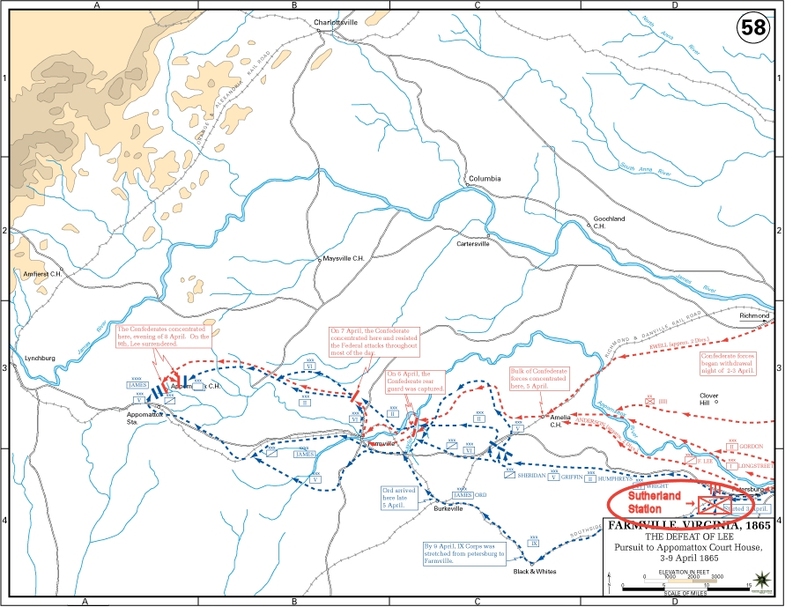 Orange ellipse, lower right: Location of the 20th Michigan at Sutherland Station, Virginia in a support position for the troops that pursued and trapped Lee’s army at Appomattox. Click on map for larger image. 150 years ago over the night of April 2-3, 1865 Robert E. Lee and the Army of Northern Virginia retreated from Richmond to link up with General Johnson’s Army of Tennessee just to south in North Carolina. Pursuing Union troops blocked every road south so Lee’s army was forced to retreat to the west. The IXth Corps which included the 20th Michigan supported the pursuit by protecting the Union’s southern flank. The IXth Corps was also quickly repairing the South Side Railroad to supply the pursuing troops by rail. This entry was posted on April 10, 2015 at 2:41 pm and is filed under Uncategorized. You can follow any responses to this entry through the RSS 2.0 feed. You can leave a response, or trackback from your own site. Love the history you share on my postcards! Thanks Len!